There’s never a McDonald’s when you need one. Yesterday, I ran out of cards that I hand out to people who might be hungry. Finding a McDonald’s is usually pretty easy but when you are out running in an unfamiliar city it becomes more difficult. Especially if you’re on the National Mall where there are no fast food outlets. 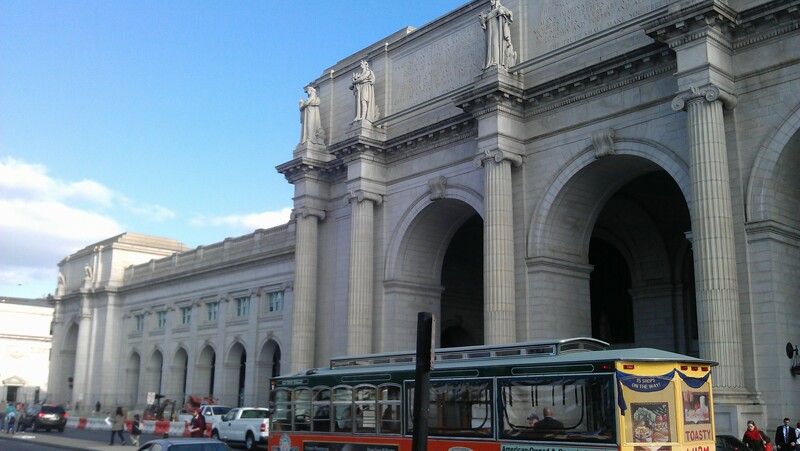 Using all my sweat-covered brain power I could muster, I reasoned that Union Station would probably have a food court. It wasn’t very far off my route so I broke stride and walked straight into the oncoming frontal assault of a commuter mob and into one of the most elegant train stations I’ve ever been in. Vaulted ceilings. Elegant restaurants. Marble or granite pillars. Checkered floors. An upscale restaurant with waiters in white. It’s the kind of elegance and style I could only dream about in an airport lobby. The kind of elegance and style that didn’t really match the sweat dripping off my nose. It wasn’t too hard to find the food court downstairs, but sadly still no McDonald’s. Looking at my choices, it seemed that Subway might suffice. After getting a few cards and standing back on first street, I noticed that the same fellow who I had given a card to yesterday morning was sitting there. The man with no legs. Out of curiosity, I jogged across the street and said hello. He was courteous and probably a bit curious why the runner with the long hair was here again. I asked him if he was from DC. “Yeah, most of my life.” he answered looking at me. I handed him one of the Subway cards. He inspected it. “They have one of those in there?” he asked. The question caught me off guard. It was pretty clear that he was a regular here at Union Station. Not knowing what restaurants were inside was just something I figured he should know. “Yeah, it’s in the food court. That should get you lunch.” I said. He appeared to ponder this. I introduced myself. I told him I was from the west coast on vacation. He said it was a long ways. In the warm morning sun we talked for just a minute longer. I got up to finish my run. He turned to me as best he could in his wheelchair. “Thank you. Thank you very much.” he said. Rudolph looked up at me and a extended smallish, callused hand. Callused from many years pushing the wheels. We shook. I smiled and waved then turned around to face the frontal assault of the commuter mob. It only dawned on me later what it might mean to not know that there’s a Subway inside of Union Station. I’m speculating, but perhaps the guards have kicked him out for panhandling. Perhaps he didn’t have enough money to even consider eating fast food. Perhaps getting a wheel chair around Union Station is difficult. Perhaps a black man with no legs doesn’t feel welcome there. I don’t know. There’s a lot of places I can go that Rudolph cannot. He faces physical challenges that I hopefully will never face. In theory, in 21st century America, the color of his skin shouldn’t prevent him from going anywhere I can’t go. In practice, I know that’s not true. Earlier in the morning, before I met Rudolph, I was running on the backside of the Bureau of Engraving and Printing. I stopped to take a picture. It must have been an odd place to take a picture because a security guard was next to me before I realized he was there. I said good morning, but it was pretty clear that he wanted to me know that he was there. A second guard got close to me in a few seconds as I ran by. I said good morning again, but it was marginally uncomfortable. Maybe that’s what Rudolph feels when he goes into Union Station. An uncomfortableness intentionally produced by a security guard who doesn’t want him to be there. An uncomfortableness produced by the stares of gawkers who’ve never seen a black man without legs. An uncomfortableness from a fear – real or imagined. I don’t know. If I was him would I go into the Subway even if I was hungry and a stranger offered me a free meal in there? Offered a meal to a man I don’t know. A man who can go anywhere he wants in a free country, but probably doesn’t. This entry was posted in While Traveling and tagged Connections, handicap, Homelessness, Hunger, meal cards, Subway. Bookmark the permalink.